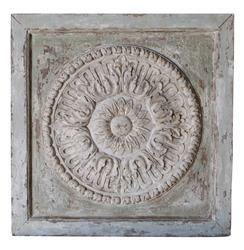 This unique carved sun panel keeps your spirits bright, even when the weather’s dreary outside. The distressed finish of muted green, light grey and taupe give this an authentic vintage look, and will have your guests wondering if you brought it back from your last trip abroad. This art panel is just the right size to help define a space within your French country home or industrial loft.